In September 2015, the United Nations General Assembly adopted Agenda 2030, which comprises a set of 17 Sustainable Development Goals (SDGs) defined by 169 targets. “Ensuring access to affordable, reliable, sustainable and modern energy for all by 2030” is the seventh goal (SDG7). While access to energy refers to more than electricity, the latter is the central focus of this work. According to the World Bank’s 2015 Global Tracking Framework, roughly 15% of world population lack access to electricity, and many more rely on poor quality electricity services. The majority of those without access (87%) reside in rural areas. 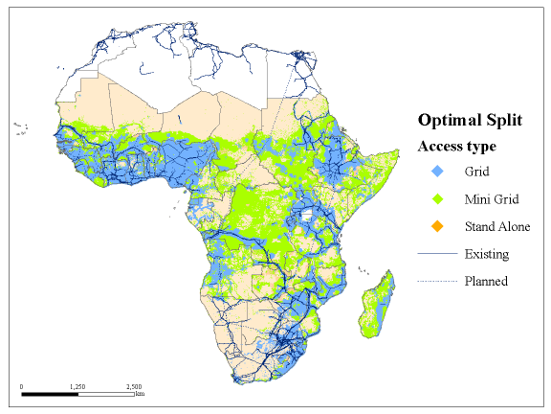 This work presents results of a Geographic Information Systems (GIS) approach coupled with open access data. We present least-cost electrification strategies on a country-by-country basis for Sub-Saharan Africa. The electrification options include grid extension, mini-grid and stand-alone systems for rural, peri-urban, and urban contexts across the economy.